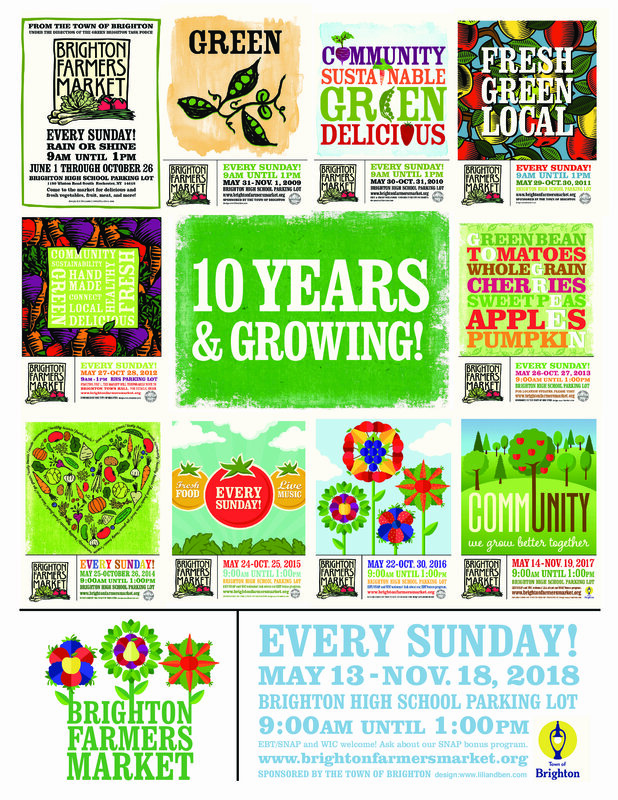 This Sunday is the final week of the regular Brighton Farmers’ Market season! Thanks to our fantastic farmers, vendors, and customers for a terrific season of all local, sustainably produced food, and for week after week of fun and community! Please be sure to join us all winter long as our Winter Brighton Farmers’ Market opens, Sunday afternoons 1-4 pm at Brighton’s Brookside Center, 220 Idlewood Rd., Rochester. Easy access to Brookside is just down the road from the summer market, off S. Winton between Westfall and 590. This week at the Market you’ll find just about everything you’ll need for a delicious, all-local Thanksgiving. Fisher Hill Farm is bringing fresh turkeys, plus sweet potatoes, brussels sprouts, squash, onions, potatoes, and more. Growing Family Farms will have certified organic salad greens, pea shots, fennel, carrots, watermelon radish, kale, kohlrabi, tomatoes, peppers, buttercup squash, delicata squash, acorn squash, and Singer Farm Naturals tart cherry juice. Andy’s Specialty Garlic & Produce will have certified organic carrots, spinach, sweet potatoes, salad mix, arugula, green kale, green romaine and red leaf lettuce, yellow onions, red beets, green summer cabbage, purple cabbage, napa cabbage, salad turnips, red and yellow potatoes, and sunflower and pea shoots. Stonecrop Farm is bringing fresh cuts of pasture-raised heritage pork, including chops, shoulder roasts, shoulder steaks, spare ribs, ground pork, sausage, hocks, bacon, deli ham, leaf fat, soup bones, trotters, and organ meats. Bolton Farms will have lettuce bouquets, spring mix, bibb lettuce, arugula, mustard greens, parsley, bok choi, no-spray brussels sprouts, and squash — butternut, honeynut, sweet meat, and spaghetti. Shannon Brook Farm is featuring grass-fed leg of lamb roasts, shoulder chops, ground lamb, and lamb sausages. K&S Bischoping will have a large selection of apples including Honey Crisp, Snapdragon, Empire, Crispin, Granny Smith, Jonagold, Gold Delicious, and Gala, and lots of heirlooms. Happy Hooves Organic Farm is bringing cuts of 100% grass-fed and grass-finished Hereford beef, cuts of pasture-raised heritage breed pork, and raw wildflower honey; all animals are raised on pasture without soy, corn, or wheat. Seaway Trail Honey is bringing fresh raw fall honey — a robust dark amber honey; summer honey — a pale, amber honey; early summer honey — a light sweet honey from basswood/linden blossoms and other wildflowers; honeycomb; cute mini bears; gift packs; certified Kosher; sweetmeats: gourmet honey with almonds, pistachio, or black walnut in honey; spice-infused honey that would make unique hostess gifts; and pure beeswax candles and turkey figurine candles; all from the small scale, small batch apiary near Pultneyville by Lake Ontario. RocBucha is bringing kombucha on tap in flavors cranberry-orange, apple-cinnamon, and pumpkin-clove. Flour City Pasta is bringing gift boxes and lasagna sheets. Pasta Classics will have ravioli flavors pumpkin, butternut squash, and sweet potato & craisin, plus cheese gnocchi and a wide variety of strombolis. Newbury Park Pastries is bringing chicken, veggie, shepherds, panang, beef stew, bbq beef brisket, and chicken & biscuit pot pies, along with seasonal pies and cut out cookies. JonJohn’s Bakery is bringing a menu of fan favorites and will be taking last-minute Thanksgiving orders for Tuesday/Wednesday pick-ups. Java’s Coffee will be offering free coffee to all! Representatives from Citizens Climate Lobby will offer information about the organization’s programs and mission.